When NASA's 2020 Mars rover lands on the red planet, it will release an unusual piece of cargo: a miniature helicopter specially built for the Martian skies. The space agency announced its plan to send an autonomous aircraft to Mars last year, and has now unveiled the design for the tiny vehicle. Building a helicopter that can survive the harsh environment of Mars is no mean feat; it has to be able to fly in the planet's thin atmosphere and survive temperatures of -75C at night (or lower away from the equator). The final design features a body the size of a softball (roughly 3.5 inches in diameter), and weighs just under 4lb. It has two sets of rotor blades, which are four feet long tip-to-tip, and will spin at 2,400rpm. That's twice as fast as helicopter rotors on Earth. It also features a solar array for recharging its batteries, which will power its flight and keep it warm overnight. “Flying a heavier-than-air vehicle within Mars’ thin atmosphere has never been done before, and we’re excited our aeronautics experts could help with this important space mission” said Susan Gorton, NASA’s manager for the Revolutionary Vertical Lift Technology (RVLT) project. The miniature chopper's main purpose is simply to prove that remote-operated flight on Mars is possible, and NASA plans to send it on five missions, each a little further than the last. While it flies, it will capture photos using a camera similar to one you'd find on a smartphone. If it works as planned, future missions to Mars could deploy more tiny aircraft, which would allow researchers to explore further beyond the reach of the landers they arrived on. 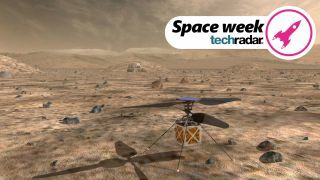 Welcome to TechRadar's Space Week – a celebration of space exploration, throughout our solar system and beyond. Visit our Space Week hub to stay up to date with all the latest news and features.